OFIS Farewell Chapel is a beautiful chapel in Krasnja, Slovenia designed to follow the lines of the landscape surrounding it. 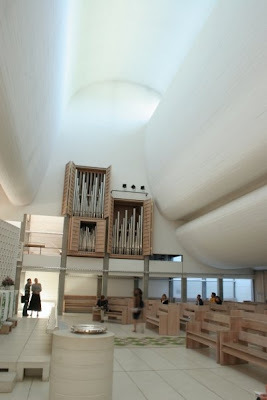 It reminds me of Bagsværd Kirke in Copenhagen, Denmark by Jørn Utzon, who also designed the Sydney Opera House in Australia. I visited Bagsværd Kirke on my birthday last year during my furniture study abroad in Scandinavia. Nothing spectacular occurred that day but I'm thankful that I got to experience the most beautiful building I had ever stepped into on my birthday. I honestly had been worried about spending it away from family and friends but this was a nice birthday moment that I think I will always remember. Most churches are a bit eerie to me but Bagsværd was just the opposite. This church was the most unbelievably serene, peaceful, and joyful place I've been. I can't even describe it. A building has never moved me before until I stepped into the main part of Bagsværd Kirke with it's undulating white ceilings, inspired by clouds, letting in lots of beautiful light. Even the corridors celebrated the natural light beautifully. I wish Bagsværd Kirke was closer to me. This would definitely be a place that I would go to to sit, relax, and center myself. It's beautiful... I've found a spot to do the same back home but I've yet to find such a spot in NY.